Time flies when you are having fun! It seems like only yesterday that I was writing about the 14th Hackfest in Gran Canaria. At the end of May 2016, we held the 15th QGIS hackfest! QGIS has been on an incredible journey since the project was started by Gary Sherman 14 years ago, and the fact that the hackfest was held in tandem with the 2nd QGIS International User conference is a testament to the growth and strength of the project. 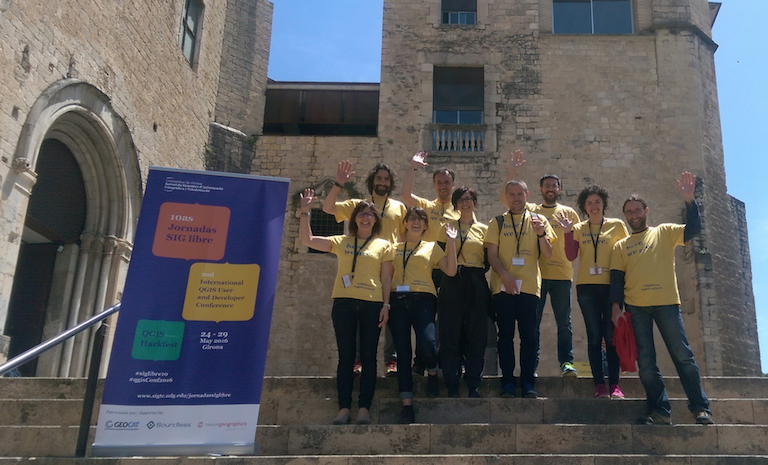 We would like to give a special thank you to the University of Girona’s Director of GIS Service (SIGTE) – Gemma Boix who helped to organised the event as well as ensuring the institutional support for the event. In case I have missed mentioning someone by name, our thanks to all the other volunteers and the sponsors of the conference. Not only did the conference team host the conference event, they also covered a large part of the costs of the hackfest that followed the conference – for which we can’t thank them enough! OSGeo also supported the hack fest financially for which we are extremely grateful. The QGIS.org project is in a very healthy state right now. For my talk at the user conference (video here) I got some fresh download stats from our servers and the numbers are quite astounding: QGIS 2.8 LTR (release Feb 2015) has been downloaded over 679, 000 times for the Windows Standalone installer (which includes all bug fix releases). Even after controlling for overestimates (from bot downloads, multiple downloads per user, “try and don’t use”) and underestimates (single downloads being distributed to many users) it is clear that we have an extremely large and constantly growing user base. By another metric, our most popular plugin, the OpenLayers plugin has been downloaded over 700 000 times! Something else that is clear from the make up of the talks, workshop topics and attendees at the user conference and hackfest: QGIS is increasingly moving from single user environments to large multi-user deployments. This ‘edge of network effect’ is a common phenomenon in FOSS and is largely how Linux came to be such a lynchpin in the dev-ops world. Sys admins and (in the case of QGIS) GIS power users, test out the software on their own devices, see the potential for it in their workplace and start integrating it into their workflows in the office until eventually it has become a mission critical piece of software for an organisation. One thing my slides probably do not make clear is that there is a huge amount of investment being made into QGIS and plugins for QGIS to fulfil a wide variety of needs. These investments are largely external to the project (i.e. not factored into the financial figures I mentioned in the talk) and happen in direct client-to-developer relationships completely bypassing (from a financial sense) the upstream QGIS.ORG project. This is a really good model since we do not need to deal with contract delivery, competing interests etc. If we do a simple calculation based on direct QGIS.org revenue for 2015/2016 (around EUR 69, 000) to downloads, the average revenue per download of QGIS 2.8.x was around EUR 0.10. All of the money we receive into the project goes into improving the QGIS, maintaining infrastructure and funding travel and accommodation for hackfests. I mention these numbers both because they are interesting and because it is good to emphasise how incredibly grateful we are to each and every one of our sponsors and donors that support the project. We really do run on a shoe-string budget and we have audacious goals and a vision to put spatial decision making tools into the hands of everyone on the planet who wants to use them. Your sponsorship and donations are a key enabler to making this vision a reality! One of the really cool things we did at the hackfest was take a little side trip to visit the Computer Vision and Robotics Institute. Natália Hurtós (who works for the institute) kindly gave a bunch of us QGIS geeks a tour. The work they are doing building [relatively] cheap underwater autonomous vehicles is really awesome and inspiring – all the more so because Natalia is planning to build the mission planning tool using QGIS libraries! Ok so what actually happened at the hackfest? Lets dig in and find out! I am only going to focus on the hackfest here because the videos from the talks at the QGIS User Conference have been posted online (see above), so you can take in all the QGIS goodness you like from those. There was a lot going on at the hackfest, so these are only the nuggets I managed to cherry-pick from the talks. the plugin author would not need to spend valuable time writing user interfaces, input validators and so on. users of the plugins could chain the tool into complex workflows easily, rather than only being able to use it on a once off basis. we would grow the amount of options available in the processing toolbox while at the same time reducing the sometimes overwhelming amount of choice in the QGIS Plugin Manager. Also on the topic of plugins, Bas Restsios from the ILWIS Project gave a demo of the ILWIS software in order for QGIS developers to be more aware of its capabilities. Although currently Windows only, the ILWIS developers are in the process of porting the software to be based on the Qt5 framework, which means us Linux and OSX users will get to enjoy using it too soon. ILWIS is Open Source and does its rendering using OpenGL. Because of their smart rendering system, everything draws lightning fast. ILWIS packs in many remote sensing tools and raster analysis tools and should be on anyone’s radar if they are interested in FOSSGIS. The best part (from my point of view) is that Bas and his team members are also busy creating a set of processing plugins for QGIS that call out to ILWIS’s command line tools. This means you can expect a huge leap forward in the number of raster based analysis functions you can do with QGIS in the near future. It was really great to have Even Rouault (maintainer of GDAL/OGR) present at the hackfest. Even recently received core committer rights to the QGIS code repository and has been making great contributions by adding support for the OGC Geopackage format (death to shapefiles!). The shapefile format is long in the tooth and doesn’t serve the GIS community well as a de facto standard for GIS data interchange. It also doesn’t make a good format for intermediate representation of data processing outputs (e.g. when using multi algorithm processing models). Even has also been working on improvements to WFS support in QGIS which many will appreciate. Not directly related to QGIS, but Even also mentioned he has been giving the GDAL driver for JPEG2000 some love – gaining good performance increases. This gives me some hope that there will be a viable open format alternative to ECW and MrSid in the future – something which QGIS will benefit from greatly. One of the interesting things that GDAL supports with the JPEG2000 specification is embedded vectors – you can write the raster with gdal_translate and then during creation pass a shapefile or GML stream to the gdal_translate command. I look forward to the day (not currently on the roadmap) where we can ship JP2 images with embedded vector masks and use those embedded vectors seamlessly in QGIS. 2.16 gets released off master. After 2.16 we create a 2x branch and the 2x branch will be put into caretaker mode. Support for Qt4 and Py2 will be discontinued in master and we do packaging only against Qt5 and Py3. Once Qt5 and Py3 only are supported in master, nightly build packages may not be immediately available on master as we need to get the packaging systems update. After 2.16 is released API breaking changes will be allowed in master (but code must build and packaging not broken, plugins will be broken). All API breaking changes should be annotated by means of a Doxygen page patch to indicate what changes were made. We target the API change window to end in Feb 2017 so that we can have a 3.0 release in March 2017. We may do a 2.18 release off the 2x branch if there have been substantial changes in the 2x branch. If there are no substantial changes in the 2x branch following 2.16, we will not do a 2.18 release. In January 2017 we will have a review to establish if all the API breaking changes are complete. If someone has specific implementation plans that are in progress and they need more time, we will (under agreement from the dev community) extend the API breaking window and may push out the release date. We propose that for general users, you rather share the following more easy to digest bullet list as it does not contain all the technical details above that mainly developers will care about. Akbar Gumbira, our Google Summer of Code (GSOC) student joined us at the hackfest. For his GSOC project, Akbar is working on a unified way to share styles, symbols, ramps and markers in QGIS. The idea will be very similar to the QGIS plugin repository, where users can host their favourite cartographic elements for everyone else to enjoy. There was quite a lot of technical discussion about the exact mechanisms to use for hosting shared symbology with the key elements of the debate being about whether to use git as a hosting system, simple zip files or some other mechanism. If you wish to chat to Akbar about his work, visit this chat room or comment on the QEP. QGIS is an attractive proposition for OSX users since the big commercial vendors typically don’t support OSX. Since QGIS is built on cross platform technologies, this does not pose a huge limitation for us, but there are few OSX developers in the QGIS developer team and the platform requirements and constraints are pretty complex. Larry Shaffer has been doing awesome work to cut through the various issues and simplify the installation process – both for end users and for developers. It’s finally pretty easy to get a development environment up and running on a Mac now. Using brew (a package manager for OSX) you can install all the needed dependencies and get QGIS compiling in Qt Creator with full debugging support. The next challenge is going to be supporting this under Qt5 for QGIS 3.0 and Larry has been doing a bunch of great work to make that happen. There are several web client frontends for QGIS out there. Lizmap is probably the most feature rich of them. Michaël Douchin (@kimaidou on twitter) showed off the latest version of Lizmap. If you are doing any web mapping, you really should check it out! Marco Bernasocchi showed off the work they have been doing on QField – an Android app for your mobile device. The workflow for using QField is simple: Create a QGIS project on your desktop, copy it over to your device’s SD Card or internal storage, then open the same project on your device. Since it uses the same QGIS 2.14 backend as you are probably running on your desktop, all the cartographic elements from your desktop are supported – including the new 2.5D rendering. The main use case for QField is field data collection and new in QField is the ability to capture point data and edit / update feature attributes. This opens many possibilities for asset management and field survey work. Marco shared some roadmap plans for QField including broader support for form elements. Value maps are already implemented, value relations, date and picture support are coming soon!. There is also beta support for digitising lines which should land in your installed version soon. I am eagerly looking forward to seeing how QField develops! During the hackfest I did some testing of QFied using a PostGIS layer in a project with the data coming from a remote QGIS server – and it works (assuming you have internet connectivity). I also did some testing using BTSync to create a synchronised file system between my mobile device and my desktop. Edits to layers on the desktop and the mobile device can easily be pushed back and forth, making it very very easy to push out maps and new data to workers in the field. There were lots of interesting things going on for those interested in testing. Alessandro Pasotti showed off some really cool stuff he has been working on for running python tests directly in QGIS instead of using a mock QGIS iface object. There are huge benefits to doing this since your tests run in a ‘real’ QGIS environment. He also showed off how they are testing QGIS plugins in Docker using the above mentioned technique. Matthias has also created a unittest subclass that you can use which includes nice goodies like letting you do asserts that geometries match. Matthias Kuhn, Nyall Dawson and others have really been leading the charge to build a more comprehensive test suite in QGIS and there were lots of other interesting tips and tricks been shown like how to make your travis tests run against multiple versions of QGIS – which can be very handy for plugin authors. Victor Olaya also showed off the tester plugin – for automated GUI testing based on recorded interaction sequences. The report plugin (see http://plugins.qgis.org/plugins/report/) that lets you trap python exceptions and send a bug report directly to a github issue tracker. Martin also showed of the First Aid plugin which lets you capture tracebacks in a more elegant way and also debug your plugin, stepping through the code and execute python instructions in the current run context. The First AID plugin makes a great alternative to using remote debugging from an IDE which is time consuming to set up and technical for less experienced developers to do. Victor Olaya showed of a plugin (the Lessons plugin) they are working on to facilitate interactive training in QGIS. It uses a simple dock interface to guide the user through a series of activities. Interestingly you can ask it to play recorded macros (saved as python code) of the active being explained so that you can see how it is done if you can’t figure it out yourself. Their authoring system also allows you to record these macros. Docker is increasingly becoming a useful building block for those wishing to deploy QGIS in server side contexts. Patrick Valsecchi and Stéphane Brunner did some really awesome work refactoring the QGIS Server docker image – you can get a preview here https://github.com/pvalsecc/QGIS/tree/docker (read the README for usage notes). Patrick’s work strips down the size of the docker image to make it much less of an overhead to pull the image. We would like to eventually merge this into the upstream QGIS repo so that we have a versioned docker build set up for each QGIS release. Martin Dobias showed off the Crayfish plugin. Crayfish includes some really awesome multi temporal visualisation tools – really useful if you have time slice data in NetCDF or similar formats and you want to view layers sequentially as animations. It also has cool symbology additions to show flow / directionality arrows over your raster. Etienne Trimaille demonstrated the work he, Ismail Sunni and Rizky Maulana have been doing to implement a QGIS Server backend for GeoNode. GeoNode is a spatial content management system that allows you to easily upload and share geospatial data on the web. With their implementation you can upload a shape file or TIFF along with a QGIS .qml style file and the layer is published directly as a tile service in the original QGIS styling. Bye-bye hard do create SLD’s, hello easy to create QGIS styles. (Disclaimer: I work with Etienne, Ismail and Rizky so I am tooting our own horn a bit here). The work of the documentation team is often overlooked in the frenzy to enjoy the new cool stuff that developers churn out. Take a look over at the documentation GitHub pulse page to see how just as much effort is going on in the documentation work. During the hackfest Yves Jacolin and the rest of the documentation team were hard at work getting things ready for the next QGIS Manual release. If you are able to lend a hand with the documentation effort (no coding skills required), please do contact Otto Dassau, the QGIS Documentation Lead! Default values for fields – Matthias Kuhn showed upcoming work to add support for field defaults in when adding a new record to a vector layer. Denis Rouzaud showed off work he has been doing to create a standard settings dialog that you can use in your plugins. It has support for different input types and layer chooser etc. They provide a settings dialog base class that you can derive from in your plugin which will take care of reading and writing your settings to Settings. Nyall Dawson chatted about his work on QGIS Task manager – a tool to let you easily create concurrent background tasks and show the progress of each task in a simple UI. I believe he is looking for funding to help him get this finished, so if you are interested please contact him. Bivariate legends plugin (not published yet). Thomas Gratier showed off work he is doing to support the creation of bivariate legends. 3D Globe updates to get it ready for production use. They have also integrated the 3D extrusion support and lots of improvements to the globe that Matthias Kuhn did as part of his masters thesis. Its really exciting to think that these improvements may make their way into the official QGIS builds sometime soon and we can all enjoy them. Redlining – you can sketch onto the map without saving those geometries in a specific layer. There were many other cool features – some of them may make their way into the mainstream QGIS desktop. If you are looking to support users who need a simplified QGIS user interface, Albireo QGIS spin off is something to watch. Girona was an absolutely awesome venue for the QGIS Conference and Hackfest. I hope the participants of the conference gained good benefit from the experience. The hackfest had around 50 participants and beyond the above notes, there was such a lot going on including work on the documentation system, discussions on the proposed community voter system (more on that in a follow up blog post) and many other things. I really encourage you to attend these events if you want to keep track of the leading edge of QGIS developers.